Ash or Soot to clean up. Different people in different parts of the U.S. have different names for what we call “Fire Pit Tables”. 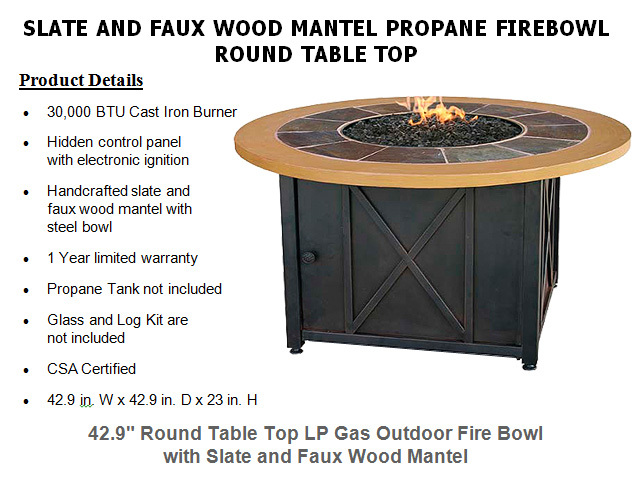 Fire Pit Tables can be called just “Fire Pits”, or Fire Bowl Tables, Propane Fire Tables, Gas Fire Pits and on and on . . . but for the purposes of this information we will distinguish between the 2 major types of Fire Pits as Gas Fire Bowl Tables and Wood Burning Fire Pits (Also known as Wood Burning Fire Places. I know – Confusing; RIGHT? Is it a good investment – Should I get Wood or Gas Burning – Do I have enough room and more . . . .
A Propane Gas Fire Pit Table is far more convenient than a wood burning Fire Pit Table with multi-point ignition systems and control knobs to start your fire, adjust the flame and turn it off, there are no start up problems, no wood burning smoke, uncontrollable flames or messy ash and soot to clean up. Conducive Weather – Almost year round evening weather just about anywhere in San Diego County is perfect for a fire pit to set the mood for a warm friendly gathering of friends and family or just you and that special someone. The Cost Factor: In this case, size matters. Smaller factory built Fire Pit Tables will cost you less and larger sizes will cost you more. Basically, besides types of materials, you will pay more for larger fire pit tables because there is more material involved. The Size Factor: Most factory built Gas Fire Pit Tables you’ll find sizes from about 20 inches to 45 inches across. You will need to measure the area where you plan to sit your fire pit making sure there is ample distance from plants or wood fences as well as ample leg room between the seats surrounding the fire pit table and the edge of the fire pit table itself. Type of Fuel: With custom built Gas Fire Pit Tables you basically have 2 choices when it comes to fuel – Liquid Propane Gas or Natural Gas. LP Gas is the most common because Natural Gas requires some fairly expensive plumbing from your homes natural gas lines to the fire pit, but if you can afford it, you won’t have to be messing with LP Gas tanks and getting them refilled. The cost of Burning fire wood versus LP Gas (Especially with the prices for firewood in San Diego) works out to LP Gas burning at 78% efficiency compared to firewood burning at about 70% efficiency. All things considered, of the two, LP Gas is the right choice for a Fire Pit San Diego Homeowners will enjoy for years to come. While a Factory Built Fire Pit Table San Diego Homeowners do consider, many opt for a Custom Built Fire Pit San Diego Style, where nothing is pre-fabricated.